Background: Resistance to change is the tendency to resist or avoid making changes; in addition, change is perceived as aversive. Resistance to change is a professional competence that can be evaluated. Objective: To adapt from the original English into Spanish the Resistance to Change Scale (RTC) by Oreg (2003) in two countries, Spain and Argentina. Method: The participants were 482 employed workers from Spain (Study 1) and 171 managers from Argentina (Study 2). Results: The results are presented in two studies and an unifactorial structure is demonstrated after exploratory factor analysis (EFA) and confirmatory factor analysis (CFA) are performed. The factor obtained has adequate reliability and evidence of validity is also confirmed if some external correlates and certain scales dealing with pro/anti-change behaviors, self-efficacy, the hardy personality and impulsivity are taken as references. Conclusions: This scale could be an ideal instrument for correctly identifying RTC and it can be used as a screening tool in combination with other instruments. Antecedentes: La resistencia al cambio es la tendencia a resistir o evitar hacer cambios; además, el cambio se percibe como aversivo. La resistencia al cambio es una competencia profesional que puede ser evaluada. Objetivo: Ha sido realizar una adaptación al español de la Resistance to Change Scale (RTC) de Oreg (2003) del original inglés en dos países, España y Argentina. Método: Los participantes son 482 empleados de España (Estudio 1) y 171 directivos de Argentina (Estudio 2). Resultados: Se presentan los resultados en dos estudios y se demuestra una estructura unifactorial, después de realizar el análisis factorial exploratorio (EFA) y el análisis factorial confirmatorio (CFA). Además, el factor obtenido tiene una fiabilidad adecuada e igualmente se constatan evidencias de validez si se toman como referencia algunos correlatos externos y algunas escalas que hacen referencia a conductas pro/anti-cambio (pro/anti-change behaviors), la autoeficacia (self-efficacy), la personalidad resistente (hardy personality) y la impulsividad (impulsivity). Conclusiones: la presente escala puede resultar idónea para identificar de manera apropiada la RTC y puede ser utilizada como una herramienta de screening en combinación con otros instrumentos. Resistance to Change (RTC) is a widely accepted construct in the framework of organizations and companies. It has been the subject of considerable interest due to the fact that it can undermine a company’s efficiency and performance (Dent & Goldberg, 1999). In this context it should be understood as a reaction against change whereby employees adopt dysfunctional attitudes and behaviors in order to obstruct change, with RTC becoming a powerful organizational strength (García-Cabrera, Álamo-Vera, & García-Barba, 2011). What benefits an organization is not always consonant with the interests of those who are asked to carry out the changes. However, some employees resist even if the changes are in line with their own interests (Oreg, 2003). Previous approaches addressing RTC have focused mainly on aspects such as power dynamics, participation, job security, organizational culture, the locus of control, self-efficacy, self-discipline, change initiatives, lack of rigidity and defensive rigidity, culture and organizational values, communication, participation and perceived benefits (García-Cabrera et al., 2011; Stewart, May, McCarthy, & Puffer, 2009). Oreg (2003: 680) specifically described the RTC scale as a dispositional measure “designed to tap an individual’s tendency to resist or avoid making changes, to devalue change generally, and to find change aversive across diverse contexts and types of change”. He conceptualizes RTC multidimensionally. The first factor is routine seeking, which refers to a personal inclination to adopt routines. The second is emotional reaction, an indicator of how much discomfort and stress an individual experiences when facing change, whether disruptive or not. The third is short-term thinking, which refers to the fact that immediate changes in plans are an inconvenience, and one can even feel uncomfortable with changes that are potentially beneficial. Finally the fourth, cognitive rigidity, which indicates a high level of difficulty in incorporating new behaviors and an exacerbated maintenance of deep-rooted personal beliefs. RTC is also related to personality (Oreg, 2003; Oreg et al., 2008), with six areas being identified: (1) Reluctance to lose control: the loss of control has been highlighted as the main cause of resistance. People may resist change because they feel it reduces their control over their living situation, and they also perceive that change is imposed and not self-initiated; (2) Cognitive rigidity: this implies some features of dogmatism. Dogmatic people are characterized by rigidity and narrow-mindedness and may therefore be less willing to adapt to new situations; (3) Lack of psychological resilience: change is a stressor, so resilience must predict the ability to cope with change. The most resilient people are more willing to change; (4) Intolerance to the adjustment period involved in change: some people resist change because it often means working more in the short term. New tasks require learning and adjustment, and some people are able to withstand better the adjustment period; (5) Preference for low levels of stimulation and novelty: some people are adaptive and prefer well-defined, familiar work, while others are innovators and need solutions outside the given framework. People who are resistant to change will have a weak need for novelty; and (6) Reluctance to give up old habits: the renunciation of old habits is a common feature of resistance to change. Some authors have explained this reluctance by arguing that “familiarity breeds comfort”. Familiar responses are incompatible when people face new stimuli, and this produces stress. Nov and Ye (2008) found that RTC is a significant predictor of the ease of use of digital library technology among students at an American university, while Naus, van Iterson and Roe (2007) found that it was a significant predictor in a Dutch union of employees’ tendencies to leave the company. The study 1 has three objectives. Objective-1: to analyse the internal structure of the original English scale using exploratory factor analysis (henceforth EFA); Objective-2: to calculate reliability; and Objective-3: to show evidence of validity. The three objectives are based on the subsample of Spanish workers. Finally, the study 2 has three objectives. Objective-4: To analyze the internal structure using confirmatory factor analysis (henceforth CFA); Objective-5: To calculate reliability; and Objective-6: To show evidence of validity. The three objectives are based on the subsample of Argentinian managers. The sample consisted of 482 employed workers from Spain (Study 1). Table 1 summarizes the main aspects of the two subsamples. Table 1: Socio-demographic characteristics of participants from the two subsamples. The Resistance to Change Scale (RTC-21; Oreg, 2003) was designed to measure an individual’s willingness to resist changes. The original English version was translated into Spanish following the instructions for translation and back-translation (Hambleton, Merenda, & Spielberger, 2005) and for the adaptation of instruments across cultures. The English version has 21 items and 4 factors. These factors are: routine seeking (α = .74), emotional reaction (α = .75), cognitive rigidity (α = .84) and short-term focus (α = .74). They were formatted as 5-point Likert scales ranging from 1 (strongly disagree) to 5 (strongly agree). The RTC scale (RTC-13; Giangreco & Peccei, 2005) has a Spanish version created by Boada-Grau, Prizmic-Kuzmica, De Diego, Boada-Cuerva and Vigil-Colet (2014). It is made up of 9 items with 2 factors, these being pro-change (α = .86) and anti-change behaviors (α = .74). They were formatted as 5-point Likert scales ranging from 1 (strongly disagree) to 5 (strongly agree). The General Self-Efficacy Scale (GSES; Sanjuán, Pérez, & Bermúdez, 2000) is unifactorial, with 10 Likert-type scale items with 4 levels (1.-False, 2.-Barely true, 3.-Rather true and 4.-True) and an α coefficient of 0.87. The Hardy Personality Scale (HPS; Moreno, Garrosa, & González, 2000) is made operative in three dimensions: commitment (α = .81), challenge (α = .81) and control (α = .75). It has 21 items, which are answered using a Likert-type scale ranging from 1 (completely disagree) to 4 (completely agree). The Impulsivity Inventory (DII; Dickman, 1990), in its Spanish version (Chico, Tous, Lorenzo-Seva, & Vigil-Colet, 2003), has 23 items and 2 subscales: functional impulsivity (α = .77; 11 items) and dysfunctional impulsivity (α = .76; 12 items). The response format is dichotomous (1=true / 0=false). Several external correlates in the form of questions that the respondents had to answer were also used. These were collected from Oreg (2003, 2006) and answered using a Likert scale with 5 levels (1.-Never to 5.-Always). Data were collected from a sample in Spain (employed workers). Sampling was used for accessibility and was non-probabilistic. The scales were distributed during working hours with the approval of those in charge of the companies, the employees and the managers. FACTOR 8.02 (Lorenzo-Seva & Ferrando, 2006) was used in Study 1 (n 1 = 482) allowing, firstly, analysis using polychoric correlation matrices, which are more appropriate when items have a Likert-type response format, and secondly, the possibility of deciding how many factors to retain from the parallel analysis (Timmerman & Lorenzo-Seva, 2011). An SPSS program (23.0) was also used. The results of Bartlett’s test of sphericity (chi square, df 66 = 1523.0; p < 0.01) and the Kaiser-Meyer-Olkin (KMO) measure of sampling adequacy (.876), higher than the recommended value of .60 (Kaiser, 1970), showed the data adequacy for applying factor analysis in subsample 1. The scree-test recommended a solution of one factor with eleven items (Table 2). Parallel analysis (Timmerman & Lorenzo-Seva, 2011) and the “minimum average partial” criterion showed the appropriateness of the one-factor solution. Table 2: RTC-11 Short Scale: Saturations matrix, mean, standard deviation, corrected item-total correlation, skewness and kurtosis for the brief one-factor scale (RTC-11) (n 1 = 482). Cronbach’s α value is .83 and the confidence interval .81-.84 (Table 3). It can be seen that these are higher than the recommended value of .70 (Nunnally & Bernstein, 1994). Evidence of validity was calculated using correlations between the RTC-11 scale and the external constructs and the contrast scale used (Table 3). There are eighteen significant correlations, of which nine are positive, e.g. age (r = .10, 𝑝 < .01), seniority in the company ( r = .08, 𝑝 < .01) and anti-change (r = .17, 𝑝 < .01), and nine negative, e.g. 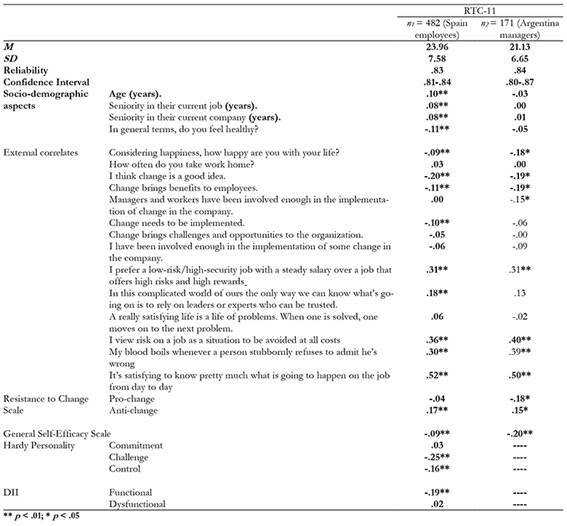 “Change brings benefits to employees” (r = -.11, 𝑝 < .01) and functional impulsivity (r = -.19, 𝑝 < .01). Table 3: RTC-11 Short Scale: Descriptive statistics, reliability, confidence intervals, socio-demographic aspects, external correlates and some scales in both subsamples. The subsample of Argentinian managers consisted of 171 participants (44.4% men and 55.6% women). The average age was 40.14 years (SD = 9.8). Table 1 summarizes the main socio-demographic aspects. To assess construct validity, the following scales were used: the Resistance to Change Scale-RTC-21(Oreg, 2003), the Resistance to Change Scale-RTC-13 (Boada-Grau, Prizmic-Kuzmica, De Diego, Boada-Cuerva, & Vigil-Colet, 2014; Giangreco & Peccei, 2005), and the General Self-Efficacy Scale (Baessler & Schwarzer, 1996; Sanjuán, Pérez, & Bermúdez, 2000). External correlates were also used (Oreg, 2003, 2006). Data were collected from a sample in Argentina (managers). Sampling was used for accessibility and was non-probabilistic. Mplus (Version 6.12) was used in Study 2. A confirmatory factor analysis was performed, obtaining a latent unifactorial-type structure. Structural equation modeling (SEM) has advantages when testing the properties of a scale and thus provides a method for examining the underlying structure of the latent variables. These are factors that cannot be directly measured but which can be estimated by other manifest variables (Schumacker & Lomax, 1996). To assess the fit of the model, goodness-of-fit indices were used in combination with the Satorra-Bentler χ2 statistic. We used the comparative fit index (CFI), the root mean square error of approximation (RMSEA), and the RMSEA 90% confidence interval. Values between .90 and .94 for the CFI indicate adequate fit, whereas values of .95 and higher indicate excellent fit. Values lower than .10 for the RMSEA indicate acceptable fit, values lower than 0.08 indicate good fit, and values lower than .05 indicate excellent fit. The RMSEA 90% confidence interval (CI) was also used to assess hypotheses of very close fit (RMSEA < 0.05) and no fit. We carried out a confirmatory factor analysis (CFA) based on structural equations in order to verify the appropriateness of the 1-factor structure (Figure 1). We made use of the following goodness-of-fit indicators: the Tucker-Lewis Index (TLI) (Lévy-Mangin & Varela-Mallou, 2006), the Comparative Fit Index (CFI) (Lévy-Mangin & Varela-Mallou, 2006) and the Root Mean Square Error of Approximation (RMSEA) (Fan & Sivo, 2007). Figure 1 shows the following indicators (RMSEA = .05; CFI = .96 and TLI = .95), which confirm an acceptable fit of the model whereby all the indicators are close to values considered acceptable. In addition, all the saturations range between .48 and .78. Figure 1 Confirmatory factor analysis of the RTC-11 scale (n 2 = 171) (chi-square = 548.651; df = 55; P-value = .0000; RMSEA = .05; CFI =.96 and TLI = .95). In this sample Cronbach’s α value was .84 and the confidence interval .80-.87 (Table 3). The values are therefore higher than the recommended value of .70 (Nunnally & Bernstein, 1994). The external constructs and contrast scales are shown in Table 3. Evidence of validity has been calculated using correlations. Eleven significant correlations are shown, of which five are positive, e.g. “It’s satisfying to know pretty much what is going to happen on the job from day to day” (r = .50, 𝑝 < .01), “I view risk on a job as a situation to be avoided at all costs” (r = .40, 𝑝 < .01) and anti-change (r = .15, 𝑝 < .05). The six negative correlations include, for example, “Considering happiness, how happy are you with your life?” (r = -.18, 𝑝 < .05) and general self-efficacy (r = -.20, 𝑝 < .01). 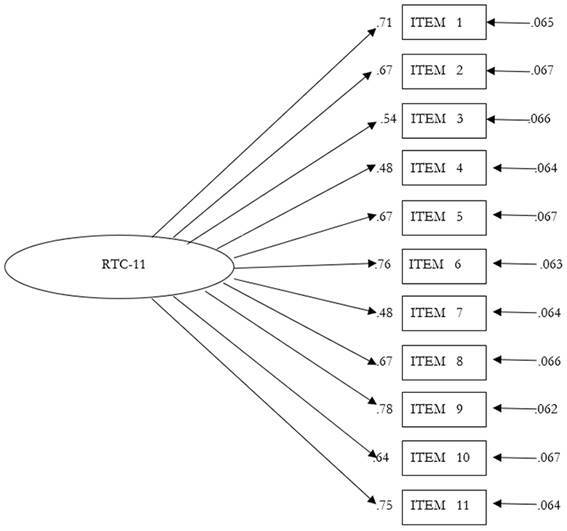 This research examined the factorial structure and other psychometric properties of the RTC-11 scale. The results support that the scale has an internal structure of one factor, adequate reliability and, in addition, appropriate evidence of validity. The RTC-11 scale is a tool for assessing resistance to change of employees and managers. RTC is understood as a preference for boredom over surprise, a denial of the benefits of labour changes, the appearance of tension and stress when facing changes, the maintenance of planned scenarios, the appearance of discomfort when faced with changes, and doing things as usual. It is the first time that this scale has been presented in a Spanish-speaking sample resident in Spain and Argentina. Objective 1 (Study 1) was to prove empirically the internal structure of the original English scale. The EFA results do not support the English four-factor model by Oreg (2003), or the three-factor model obtained by Stewart, May, McCarthy and Puffer (2009) in a Russian-speaking sample (Russia and Ukraine). The Spanish version we present is unifactorial. The first objective is therefore not achieved. Objective-2 (Study 1) and Objective-5 (Study 2) were to analyze reliability. 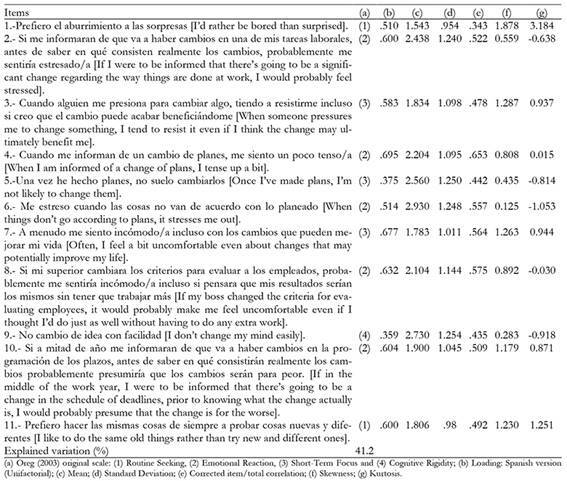 The overall reliability of the scale in Spanish in the two subsamples is .83 and .84 respectively. In the English version, total reliability is .92 (Oreg, 2003) and .86 (Oreg & Sverdlik, 2011). The Russian version has a reliability of between .55 and .69 (Stewart et al., 2009). Objectives 2 and 5 are therefore confirmed, since the reliability of the Spanish version is optimal. Objective-3 (Study 1) and Objective-6 (Study 2) were to show evidence of validity. In terms of these objectives, the data resulting from the present study generally indicate that the factor from the scale analyzed is significantly associated with other scales and external correlates. Both objectives are therefore confirmed (3 and 6). Objective-4 (Study 2) was to analyze the internal structure using CFA (RMSEA = .05; CFI = .96 y TLI = .95). The best structure was the one-factor structure. In this regard the present objective is confirmed, since the EFA from Objective-1 (Study 1) is corroborated. The CFI index of the Russian-speaking sample (Stewart et al., 2009) from Russia (CFI = .90) and Ukraine (CFI = .94) is not as good as those found in the English sample (CFI = .96) (Oreg, 2003) and the Spanish sample (CFI = .96). The limitations of this study are discussed below. Firstly, the use of self-reporting may have caused an increase in the association between variables due to common-method variance (Podsakoff, MacKenzie, Lee, & Podsakoff, 2003). For this reason we incorporated external correlates that mainly correlate with the scale we present. Also, self-reporting has been widely used in other research into RTC (Giangreco & Peccei, 2005; Oreg, 2003; Oreg et al., 2008; Oreg & Sverdlik, 2011). And secondly, random sampling procedures should be used in order to increase the external validity of the results. However, the use of convenience samples in the validation of scales is relatively common in research into RTC (Giangreco & Peccei, 2005; Oreg, 2006; Oreg & Sverdlik, 2011; Stewart et al., 2009). In principle, the use of these types of sample presents no important threat to the validity of the study (Highhouse & Gillespie, 2008). The choice of sampling type is usually based on the researcher’s limitations, both practical and logistical.